SII Semiconductor Corporation, a subsidiary of Seiko Instruments Inc., introduces the S-8223A/B/C/D Series 2-to-3 cell secondary battery protection IC for lithium-ion rechargeable batteries. They are characterized by an ultra-small SNT-6A package measuring 1.6 x 1.8 x 0.5 mm and a current consumption of only 0.25 μA. The current consumption is one fourth of existing products so this makes the S-8223 A/B/C/D Series the lowest in the industry*1. The S-8223A/B/C/D Series is ideal for protecting lithium-ion batteries in laptop computers and other portable devices. The main feature of the newly introduced S-8223A/B/C/D Series is the ultra-small SNT-6A package measuring 1.6 x 1.8 x 0.5 mm, which leads to a reduction in the size, thickness and weight for portable devices. Secondly, the industry’s lowest operating current consumption of 0.25 μA, helps prolong the battery operating time. Lastly, the S-8223 Series has the industry’s highest class*2 accuracy in overcharge detection voltage at ±20 mV. This provides enhanced safety monitoring of lithium-ion rechargeable batteries. 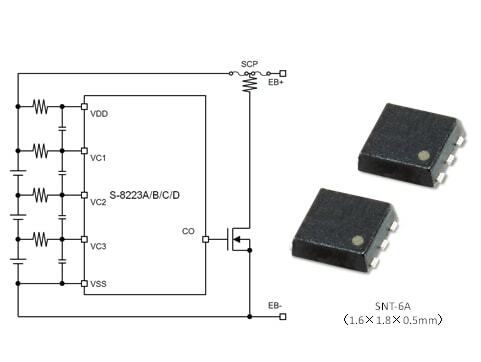 The S-8223B/D Series has a gate connection terminal of the charge control FET equipped with an output voltage control circuit, meaning the series is also compatible with a FET at a gate-source withstanding voltage of 12 volts.